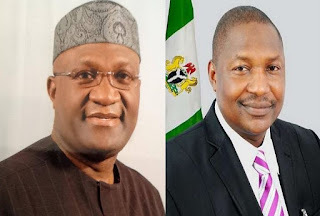 The umbrella socio-political organisation of Ndigbo, the Ohanaeze, has berated the the Attorney General and Minister of Justice, Alhaji Abubakar Malami, for applying to the court for the revocation of bail conditions given to the leader of the Indigenous Peoples of Biafra (IPOB), Mazi Nnamdi Kanu. The Ohanaeze said in a statement issued on Saturday and signed by its President-General, Chief John Nnia Nwodo, titled ‘Attorney-General of the Federation, Please Respect Your Oath of Office’ that they are surprised that Malami is prepared to contest the superiority of the provisions of the constitution on fundamental human rights of freedom of movement and freedom of association over an erroneous judicial proclamation violating those rights. “I am equally miffed by the audacity with which the Attorney-General displays his bias without regard to his oath of office”, Nwodo said. The Ohanaeze leader noted that just within the week, the chairman of the Northern Governors Forum and in total defiance of the Head of State’s proclamation of the rights of a citizen of Nigeria to live anywhere in Nigeria and to do business anywhere in Nigeria, the Arewa Youths, pretending to withdraw their quit notice gave qualifications to the Head of State’s proclamation, issuing conditions for enjoyment of citizenship status. And these same Arewa Youths are supposed to have been arrested on the orders of the Governor of Kaduna State and the Inspector-General of Police for acts of treason, conversion and sedition. “Nnamdi Kanu, as a citizen of Nigeria, is free to hold any point of view no matter how displeasing to anyone so long as they are not inciting or provoking any criminal activities”, Ohanaeze insisted. The statement urged the Attorney General to note that: “In democracies leaders are abused, pelted with rotten eggs and booed at, as the former Edo State Governor was booed in Abuja a few days ago. These acts are not necessarily criminal”. Nwodo finally advised the Attorney-General not to exacerbate “our already tense nation by commencing a legal action which portrays him as biased, insensitive and misdirected”.